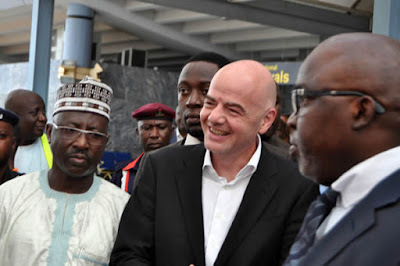 President of world football –governing body, Mr. Gianni Infantino and the Secretary General, Ms Fatma Samoura arrived in Nigeria’s capital city, Abuja, on Sunday. They were accompanied by executive assistants Mattias Grafstrom and Veron Mosengo-Omba. 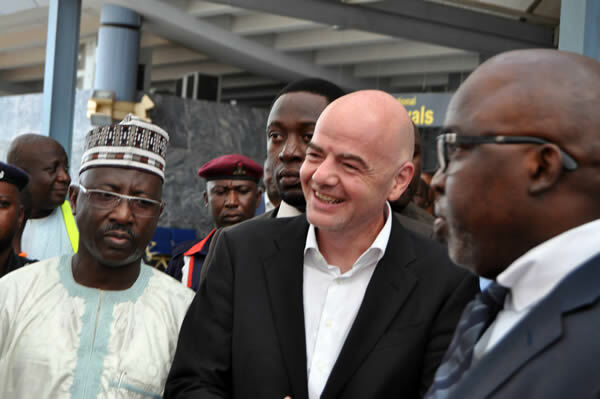 The world football governors were received on arrival at the Nnamdi Azikiwe International Airport by NFF President Amaju Pinnick and General Secretary Mohammed Sanusi, vice presidents Seyi Akinwunmi and Shehu Dikko, and other members of the NFF Executive Committee and Management. A 10 –year old girl handed the 46 –year old multi –lingual Infantino a bouquet of flowers as the train emerged from the arrival hall, and a cultural troupe entertained in the foreground as Infantino and Samoura walked on the red carpet to waiting cars. At the Transcorp Hilton Hotel, Pinnick accompanied Infantino to the presidential suite, and meetings between the FIFA President and the NFF Board and with the visiting FA presidents from other African countries, as well as a cocktail dinner were on the programme for the night. A total of 17 FA presidents from other African countries arrived in Nigeria on Saturday to join the NFF in receiving Infantino. These are Kwesi Nyantakyi (Ghana), Lamin Kaba Bajo (The Gambia), Isha Johansen (Sierra Leone), Musa Bility (Liberia), Juneidi Basha Tilmo (Ethiopia), Nicholas Kithuku (Kenya), Andrew Chamanga (Zambia), Philip Chiyangwa (Zimbabwe), Frans Mbidi (Namibia), Chabur Goc Alei (South Sudan), Walter Nyamilandu (Malawi), Abdiqani Said Arab (Somalia), Vincent Nzamwita (Rwanda), Moses Magogo (Uganda), Jamal Malinzi (Tanzania), Augustin Senghor (Senegal) and Souleman Waberi (Djibouti). On Monday, Infantino and Samoura, alongside Sports Minister Solomon Dalung, NFF President Pinnick, chairmen of the Senate and House sports committees, NFF General Secretary and other NFF Board members, and the visiting FA presidents from other African countries, will pay a courtesy call on His Excellency, President Muhammadu Buhari at the Aso Rock Presidential Villa. Also on the programme for Monday is an U13 exhibition football match at the National Stadium, visit to the new NFF headquarters and a business dinner with Nigeria’s political heavyweights and captains of industry.